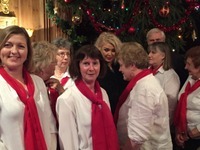 Knebworth Community Chorus is based in Knebworth, Hertfordshire, with the B197 running through the main village and a railway station on the Cambridge line out of London Kings Cross. Rehearsals: We usually rehearse at Trinity Church, Park Lane, Knebworth, SG3 6PD, which is around 100m from the railway station on the left as you go up Park Lane. Concerts: Many of our concerts are held at Knebworth Village Hall, Park Lane, Knebworth, SG3 6PD. The Village Hall is around 100m from the railway station, on the left as you go up Park Lane.